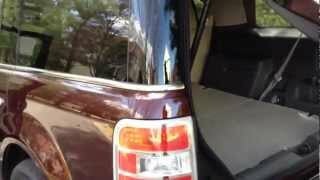 Ford Flex 2012, the three-row seven passenger crossover delivers a distinctive high-tech package in an SUV packed with a 3.5L EcoBoost V6 engine. No other three-row crossover looks like the 2012 Ford Flex. And no other three-row crossover offers the same combination of fuel economy, power and conveniences. Flex was an early recipient of Ford EcoBoost™ technology. The efficient 3.5-liter EcoBoost V6 is available on Flex Limited and Titanium, delivering power comparable to a standard V8 engine. Flex also continues to offer the only refrigerated console – mounted between the second-row captain’s chairs – in the class. Versatility continues to be a hallmark with Ford Flex, as roof rack side rails are now compatible with the popular Vista Roof™, allowing customers to enjoy the scenery while hauling their gear. Introduced last year, the Titanium series remains the hero model, building off the extensive content of the high-series Flex Limited with distinctive beltline molding, grille (black chrome finish), roof (black), mirror skull caps (black), liftgate appliqué (black chrome) and fog lamp bezels. Additionally, 20-inch polished aluminum wheels are standard on Flex Titanium. 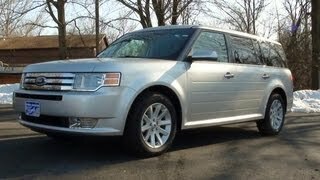 Standard on Ford Flex is a 3.5-liter V6 that delivers 17 mpg city and 24 mpg highway (front-wheel drive). Both the standard V6 and the EcoBoost V6 are matched to a fuel-saving six-speed automatic transmission, with available SelectShift™ functionality. 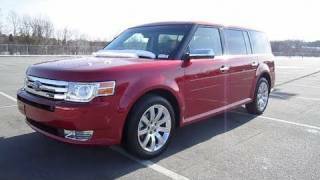 The 2012 Ford Flex builds off a Top Safety Pick rating from the Insurance Institute for Highway Safety. 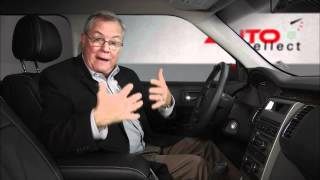 To earn a Top Safety Pick, a vehicle must receive a rating of “good” in offset frontal-, side- and rear-impact crash tests and roof strength evaluations, as well as offer electronic stability control. AdvanceTrac® with RSC® (Roll Stability Control™) is standard on every Flex. Flex Limited and Titanium series have available upgrades to the second- and third-row seating for 2012. The 60/40 split fold-flat second-row bench seat now includes a flip-out armrest with two cupholders; the one-touch PowerFold® and tumble third-row 50/50 split fold-flat bench with tailgate is available as well. Class-exclusive SYNC® is available and provides hands-free access with simple voice commands. Every vehicle with SYNC offers hands-free calling via paired and connected Bluetooth®-enabled phone, hands-free music via USB-connected digital media player and customer support and software updates via SyncMyRide.com for registered owners. Other available SYNC Services features include Traffic, Directions and Information, which allows customers to receive traffic alerts, turn-by-turn directions and a business search through the radio, hear personalized news, weather, horoscopes, stocks, movie times and sports content, get travel information and send directions directly to the SYNC system. Also available is Vehicle Health Report, which allows customers to receive an online report of vehicle diagnostics, and 911 Assist™, which can connect directly to a 911 operator through the paired mobile phone after an accident in which an airbag deploys. Additionally, the rear windshield wiper on the Flex is now center-mounted. 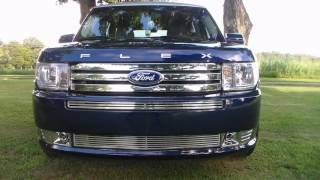 The Ford Flex is built at Oakville Assembly Complex in Ontario, Canada.